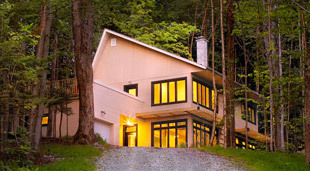 Company’s Vertendre in Eastern Township offers the experience to stay in a remote cabin, but completely disconnected from the electricity grid without compromising comfort. The energy to power the lights and the fridge of the cottage, for example, comes from solar panels. To make the popcorn machine work, it will, however, pedaling a stationary bike! “The bike is more fun than anything else. I think it’s mostly a showcase for how to incorporate more energy practices in our daily lives, “says co-founder LaFabrique Julien Lamarche. The use of space chalet is maximum. A bed is installed in the ceiling during the day and in the evening he went down on the ground with a pulley system. “Every square foot, even the bed you over the head, is used. This is an example to show that we are able to use a space in the evenings and recover during the day! It’s interesting, “says Antoni Daigle Regional Environmental Council of the Eastern Townships. The positioning of the cottage, the many windows on the south side, the use of heat recovery materials and choice of appliances are all tools used to make it completely independent of electrical consumption chalet.